Like The Office, ABC's Modern Family is another comedy series that doesn't overlook Halloween, and this season will be no different. Tomorrow night, the Emmy Award winning comedy series will acknowledge the spooky holiday and we have some photos from the episode. And as a bonus, ABC released a clever Modern Family-inspired horror movie trailer. Check it out ahead! Before we get to the details and photos for "Open House of Horror," which airs tomorrow night, see how ABC turned one of their funniest sitcoms into a scary movie with this clever trailer. Ah, the magic of editing! When you factor in Fizbo the Clown and the mockumentary-style of Modern Family, it almost seems like it would've been too easy for them to twist the footage and add a creepy voice-over to turn the comedy into a found-footage scary clown movie. But that wouldn't be giving the show the credit it deserves. What we have here is a funny idea and some great editing. 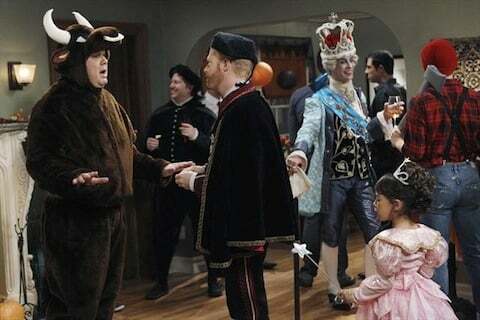 And it makes me even more excited for the next new episode of Modern Family. Speaking of which, check out the episode description and some photos for tomorrow night's "Open House of Horrors" ahead. Spoilers after the jump! Want an example of Claire overdoing Halloween? We might have one among these photos. Here she is offering some trick or treaters some candy. Maybe she'll have better luck as Bo Peep. Claire isn't the only one switching costumes, it seems. The photos below show Cam in two different costumes. Not sure what the story is there other than that they're hosting a costume party. And would we put it past Cam to change costumes midway through the party? Or maybe one's for trick or treating and another's for the party…? And here it looks like Evel Knievel might be neglecting his pregnant alien wife. Modern Family airs Wednesdays at 9:00 p.m. ET on ABC.